Businesses take the time to draft, sign, and review contracts because they provide a much-needed layer of security. The contract may be between businesses, between a business and its employees, or even between partners and shareholders. Having these contracts in place allows businesses to make smart decisions. But what happens when the terms outlined in those contracts are broken? All too often, individuals and businesses breach contracts that they have previously agreed to. When this happens to you, it can come as a huge surprise and completely alter your plan of action for your business. Many people feel unsure about their next steps when they believe a contract has been breached, and too many people fail to seek legal action to ensure that both parties uphold their end of the bargain. 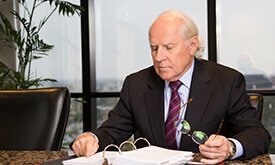 This is where having the right attorney will make all the difference. In most breach of contract cases, there are a few key facts that need to be established in the court. The general facts above are only part of what the court will want to see in your breach of contract case. Depending on whether you’re the one who takes the case to court or you’re being accused of breaching a contract, there are several other steps you should take to prepare. Essentially, it will be your job as plaintiff to prove to the court that there was definitely a contract with this party and that this party clearly breached the agreement. This is much easier said than done.